Reviewed by Richard Raymond III | Richard Raymond III is a former Marine who also served as historian for the 116th Infantry, Virginia Army National Guard. Dangerous to the nth degree, as war itself must be, it is hard to imagine a more perilous assignment than to be inserted by parachute or small boat into the amorphous area behind the lines of an enemy well-known for their merciless savagery. For an agent on such a mission, to be captured alive meant torture and inevitable death, usually hideously brutal. Yet even before Pearl Harbor, when the United States was forced into World War II, President Franklin D. Roosevelt had taken steps to create an agency first called the Office of Coordinator of Information; named Col. William J. Donovan as its chief; and authorized him to recruit, train and employ hundreds, then thousands, of gifted intelligence analysts. One doubts that anyone but a proven war hero, brilliant lawyer and superb organizer such as Donovan could have been successful in this unprecedented task. Soon the group changed its title to Office of Strategic Services and expanded its role to include battalions of spies and saboteurs, operating in Europe, the Far East and many points in between. Hence the rather quaint appellation of “Donovan’s Devils,” a term possibly offered by a Hollywood flack, but quickly adopted by the Operational Groups. 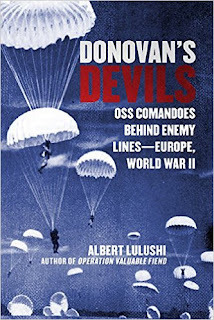 Though the OSS reach encompassed every theater of war, this book — by an author whose personal experience treads very close to having been a Cold War intelligence agent — is generally concerned with Western Europe and the Mediterranean region. With eight pages of illustration and maps, 18 pages of chapter notes, an 11-page bibliography and eight pages of photos, it would seem to be suitably documented. Perhaps had the maps been a bit clearer, and a few typos and misspellings been edited out, it would have appeared still better. Among its interesting features is a series on the execution of a former Nazi general tried and condemned for his willingness to carry out Hitler’s command to shoot OSS and other agents and who ordered the murder of 15 captured Americans. Neither their uniforms nor the Geneva Convention rules availed to save them as prisoners of war. The author describes in detail the training, arming and transportation of teams into German- and Italian-held territories, their heartening successes and lamentable failures. Failure for certain teams often meant utter destruction and barbarous reprisals on local civilian populations. Yet the effort persisted and contributed greatly to the eventual success of the regular military forces. The French Resistance, feeble at first, was gradually strengthened and supported. Huge amounts of arms, ammunition, explosives and other vital supplies and equipment were delivered by boat or parachute, and were quite useful in cutting German transportation and communications at the time of the D-Day landings in Normandy. So “Donovan’s Devils” did their work, and their experience was not to be lost, for veterans in many cases went on to fight the Cold War, and form the nucleus of present-day Special Forces. Stimulating reading, for those who relish tales of derring-do.